A rendering of the new station. Rhode Island Governor Gina Raimondo joined with Rhode Island's Congressional Delegation - Senators Jack Reed and Sheldon Whitehouse and Congressmen James Langevin and David Cicilline - Rhode Island Department of Transportation (RIDOT) Director Peter Alviti and Rhode Island Public Transit Authority (RIPTA) Chief Executive Officer Scott Avedisian recently with other federal, state and local officials to celebrate the groundbreaking for the new Pawtucket-Central Falls Commuter Rail Station and Bus Hub. The new intermodal transit center will allow riders to switch modes easily between commuter rail and RIPTA's statewide bus network. 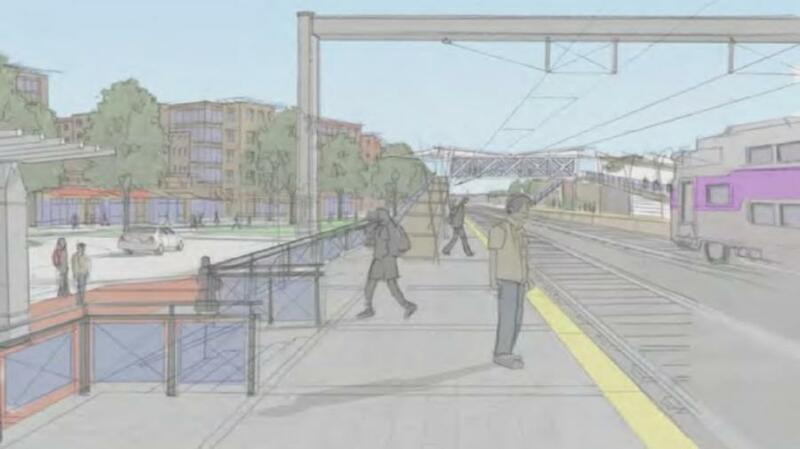 When complete, the commuter rail stop will join three other stations (Providence, T.F. Green and Wickford Junction) serviced by the MBTA, with numerous stops in Massachusetts on route to South Station in Boston. "This is a fantastic day as we further strengthen our transportation system and plant the seed for new development that will rise up around this transportation center," Gov. Raimondo said. "It's also a sign that Pawtucket and Central Falls are on the map and poised to be major players in the economic revival of the Blackstone Valley and the entire State of Rhode Island." "I credit Mayor Grebien and Mayor Diossa for their vision, tenacity, and leadership in making this happen. When it's completed, this new station and hub will bring opportunities for smart growth and development for Pawtucket and Central Falls," said U.S. Senator Jack Reed, the Ranking Member of the Appropriations Subcommittee on Transportation, Housing and Urban Development (THUD), who earmarked over $1.9 million in 2008 for Pawtucket and RIDOT to undertake preliminary engineering and environmental studies to support the project and has since led efforts in Congress to increase federal appropriations for TIGER - now known as BUILD - and bus facility grants. "I commend Mayor Grebien, Mayor Diossa, Governor Raimondo, RIDOT, and RIPTA for working together to develop a common vision to improve transportation options, advance smart growth, and create new economic opportunities in the area. I will continue working at the federal level to continue to support smart transportation investment in the Ocean State," said Reed. "As a strong advocate for investing in infrastructure, I'm proud that the federal funds we fought for made this project possible," Senator Whitehouse said. "Once completed, this new commuter rail station will increase public transportation options and create economic development opportunities for Pawtucket, Central Falls and the surrounding communities," said Congressman Jim Langevin. "I was proud to join my colleagues in the delegation to secure federal funding for this transit facility that will serve communities across northern Rhode Island." "This project is an important investment in our state's infrastructure and will support good-paying jobs," Congressman Cicilline said. "Once complete, this intermodal transportation center will provide needed transit options for residents in the Pawtucket and Central Falls area and will spur further economic development." "The Pawtucket Central Falls Commuter Rail Station and Bus Hub will not only allow for easy transportation in and out of the Blackstone Valley, but will also attract and retain new businesses and residents, revitalize even more of our mills and improve our streetscapes. This project will become a driving economic factor," said Pawtucket Mayor Donald R. Grebien. "I would like to thank Governor Raimondo, the Congressional Delegation, and everyone involved that has made this project possible." "I couldn't be more excited to break ground on this important project for Central Falls/Pawtucket and the Blackstone Valley," Central Falls Mayor James Diossa said. "Our residents deserve to have access to a transit center that will help connect our region to the Boston market. The development will help drive our economy, create new housing, retail and create employment opportunities for the two cities." "These communities have longed for this transit center ever since the last station closed in the 1980s, and the concept of a new train station has been talked about for several years," RIDOT Director Peter Alviti Jr. said. "At the new RIDOT, we're pleased to finally bring all that talk into reality, into a new integrated transit facility for which we kick off construction today." "RIPTA is pleased to partner with RIDOT on the creation of a new commuter rail station and bus hub for the greater Pawtucket area," said Scott Avedisian, CEO of RIPTA. "We will be using grant funds from the Federal Transit Administration (FTA) to invest in this new transit center and to also create a corridor with high-frequency bus service. These investments will replace aging transit assets with new passenger facilities and improve bus service in an urban area that has some of the highest transit usage in the state." "Today's announcement is one in a series of new investments to be made in Pawtucket, including Main Street Improvement Fund awards and continued support for the city's small businesses," said Rhode Island Secretary of Commerce Stefan Pryor. "The building of this station will increase access to public transportation, create construction jobs, and catalyze commerce in the area. We look forward to the station's success and we're excited about Pawtucket's potential." Construction will be led by Barletta Heavy Division, Inc., to be delivered through a design-build process that will expedite construction and navigate through the complexities of building a new train station along the Northeast Corridor, one of the busiest stretches of passenger rail in the country. The contractor will build the new bus hub simultaneously. Originally envisioned as two separate projects, RIDOT, with RIPTA, included construction for both modes of travel in its request for proposals (RFP). The budget for this project is $47 million, and includes funding from a combination of sources including a highly competitive $13.1 million grant through the federal Transportation Investment Generating Economic Recovery (TIGER) grant program and a $7 million grant from the Federal Transit Administration to RIPTA for the bus hub component. Additional Federal funds amount to $18 million, State funds $5.9 million and the communities of Pawtucket and Central Falls are also providing funding to the project, jointly contributing $3 million. Following the groundbreaking ceremony, construction began immediately and will continue for three years, reaching substantial completion in late 2021. The timeframe accommodates limited construction time periods along Amtrak's busy rail corridor, with much of the work only taking place during overnight hours when trains are not running. RIDOT expects that service would begin in Summer 2022 after a thorough testing and commissioning period led by the MBTA to ensure smooth operations and passenger safety. The Pawtucket-Central Falls Commuter Rail Station and Bus Hub was made possible by RhodeWorks, RIDOT's ongoing commitment to repair structurally deficient bridges and bring Rhode Island's transportation infrastructure into a state of good repair, promote economic development, and create jobs. For more information, visit www.ridot.net/RhodeWorks.